The experience of environmental governance is approached in Improving Global Environmental Governance from the unique perspective of actor configuration and embedded networks of actors, which are areas of emerging importance. The chapters look at existing Multilateral Environmental Agreements (MEAs) and the broader constellation of partially networked institutions to better understand the involvement of individual actors and how to deepen the networks that include them to generate more effective governance. The book covers a wide range of issued pertaining to environmental governance including trans-boundary air pollution, marine pollution, biodiversity and ozone depletion. It also examines partnerships as a hybrid case of emerging modes of environmental governance. These partnerships are a recent form of actor configuration that warrant attention for dealing with global environmental threats in order to better understand the full potential of actor configurations in the absence of state involvement. In order to test applicability to on-going but stalled processes, the book applies the approach to one of the most difficult issues we face: climate change. 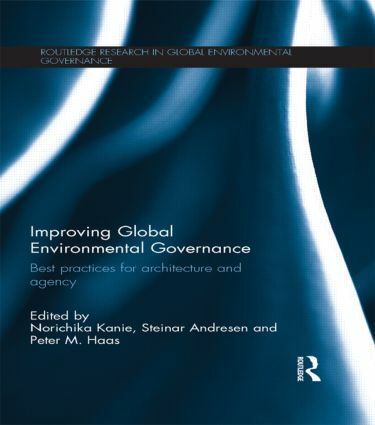 By addressing key questions in this important area, the book provides new perspectives in the nexus between agency and architecture in environmental governance in the twenty-first century.